New Batch of Speakers Revealed! The real strength of Codemotion Berlin is the quality of the content. This November over 60 of the world most inspiring speakers will share their insights on how they see the technology evolving, discussing the latest trends. We’re thrilled to announce a new batch of speakers! Willing to discover who will take the stage at the upcoming edition of Codemotion Berlin? 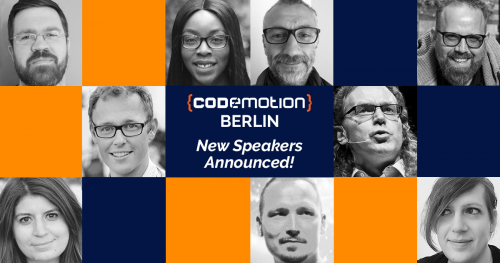 For more information on each and every speaker, check out all the confirmed names for Codemotion Berlin 2018. More exciting news on the horizon! This is just the beginning of our announcements. 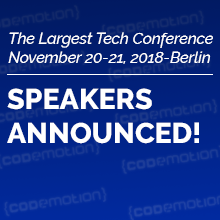 We’re set to surprise and delight with more top speakers along with hundreds of tech leaders, innovative business owners, the leading tech companies, and tons of networking with the other 700 attendees at Codemotion Berlin… So don’t snooze! Willing to be part of it all? Early Bird Tickets will expire next Thursday, July 26. Secure your seat now before the price goes up!